LOS ANGELES, CA / ACCESSWIRE / October 4, 2016 / Erika Scilipoti is proud to announce her new line of textile products which are inspired by her photography of nature. Having studied the visual system and how it interacts with higher-level cognitive functions, Scilipoti one day asked herself: "What really moves me?" Her practice of meditation and her love of nature gave her a sense that being is a process experienced with all senses of the body- "feeling like the flower in the sun, being the drop of rain." She wanted to turn her photographs of nature into something tactile that could be worn or experienced first-hand, so she went to work reproducing her prints on high quality materials like silk and cotton/linen blends. After months of testing and deep contemplation, Scilipoti finally came away with a new line of tea towels and silk scarves that are a testament to her personal experience with nature and mindful living. The tea towel collection offers 9 designs, each representing a heart-centered quality inspired by nature. The towels are made of a cotton/linen blend and are digitally printed by a company in Durham, North Carolina and sewn in Fall River, Massachusetts. The printing process uses eco-friendly, water-based inks on with no additional chemicals. The silk scarf collection represents Scilipoti's desire to pair the visual sensation of vibrant flowers and leaves with the soft feeling of luxurious silk on the skin. The collection offers 6 designs including tulip petals, agave, Japanese maple leaves, winter flowers, rosy, and bird of paradise. The scarves come in 2 sizes, and will be digitally printed and hand hemmed by a manufacturer near Como in Italy; chosen by Scilipoti for their expertise and craftsmanship of high quality textile products. 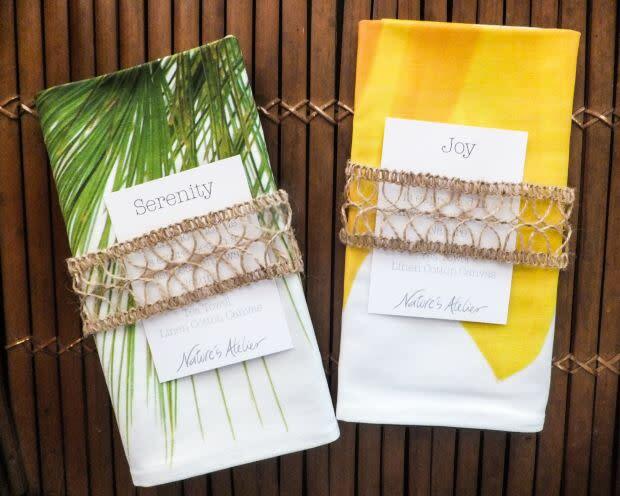 With her first production run getting rave reviews from customers, Scilipoti has taken Nature's Atelier to the pages of Indiegogo where she hopes to raise the funds necessary to introduce her products to a wider audience. "With this project I wish to bring awareness to the restorative effects that natural environments have on all of us, offering relaxation, improving our mood and cognitive functions, and stimulating our creativity. I believe that a more mindful way of living, such as slowing down to see and enjoy our surroundings with all our senses and body, will encourage a deeper appreciation of our natural environment," says Scilipoti.